I woke up the other day craving my Mom’s food. No idea why. All I knew was that I needed a huge dose of Vietnamese fare. I combed through recipes and cookbooks, planned the week’s menu entirely on dishes of my childhood and hauled myself to the asian supermarket (that’s a post in and of itself). Luckily for you, all ingredients can be sourced at Whole Foods or at your regular supermarket, give or take a few herbs. So fresh, light and yummy! 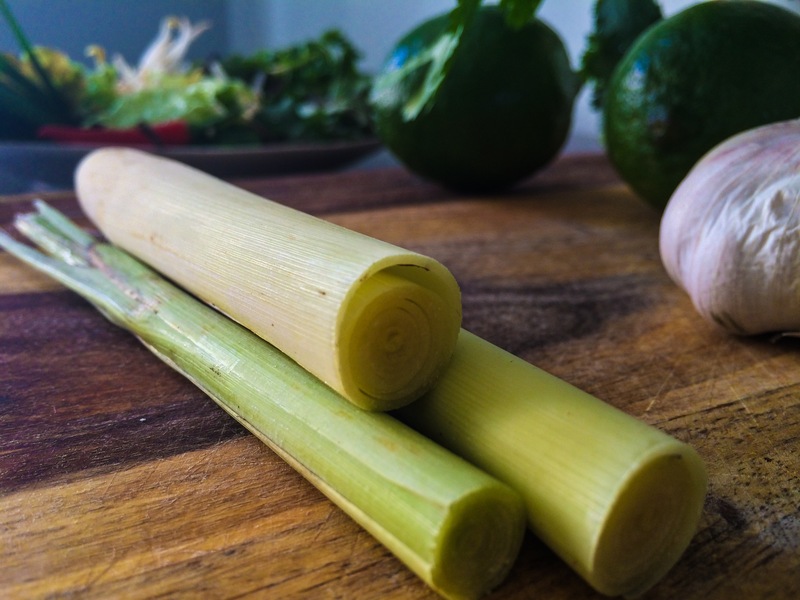 There is very little cooking for this recipe and more ingredient prep. Most everything can be done ahead of time, you just have to be organized. This is a great interactive meal, or you can pre-roll the beef and cover with a moist paper towel for easy transport. I thank the good Lord above that THIS asian-y-goodness is what I am privileged to call my comfort food. Enjoy! My beautiful local, grass fed london broil. 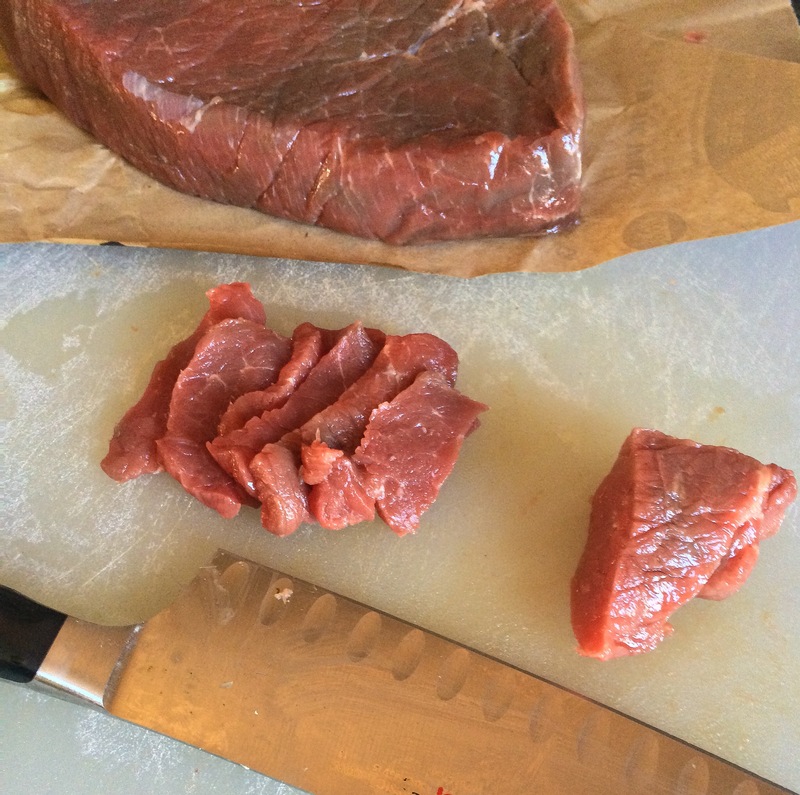 Tip: freeze for 1 hour before slicing. Makes it a MUCH easier task. Combine all marinade ingredients, let sit for 15 mins. 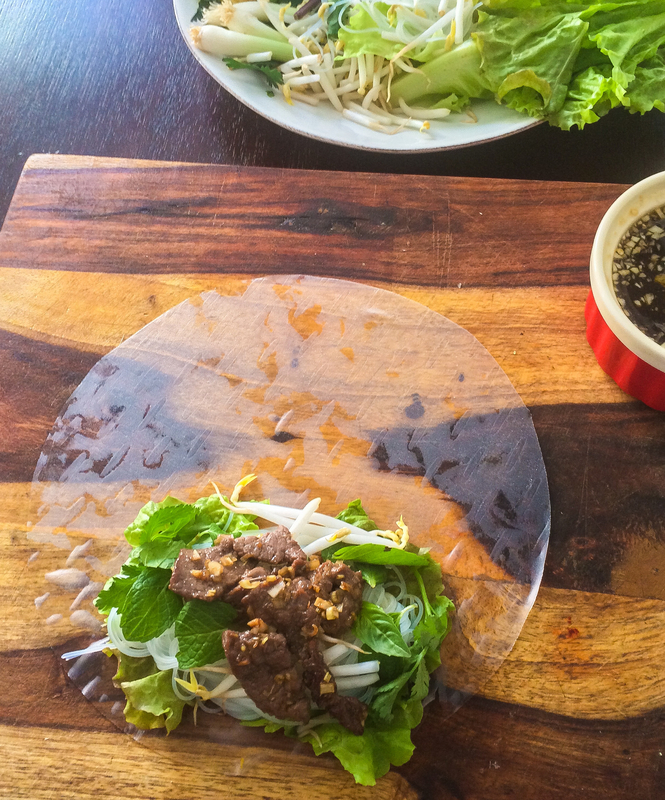 Assemble the table salad on a large serving plate, rice paper sheets go on a separate plate. Place a large, deep dish of hot water on the table. 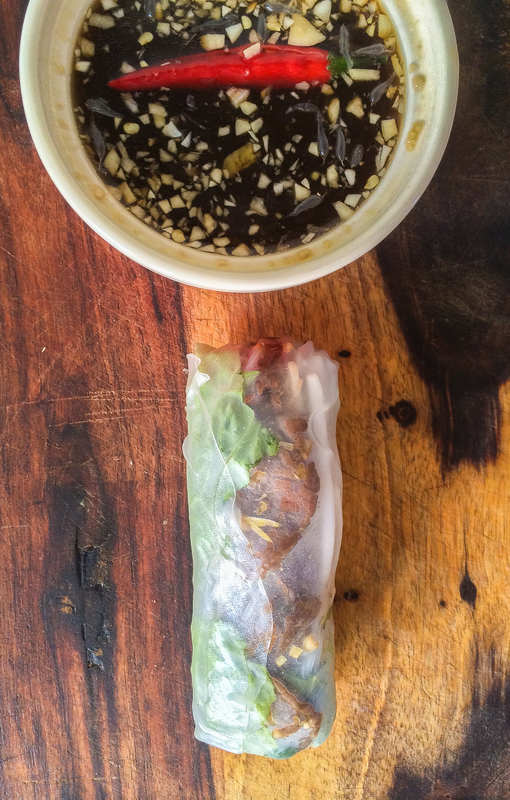 Combine all vietnamese dipping sauce ingredients, stir until the sugar has dissolved. Separate into individual dishes. Preheat a large pan, wok or grill on very high. Sautee beef until just done, about 20 seconds (ish) per side. 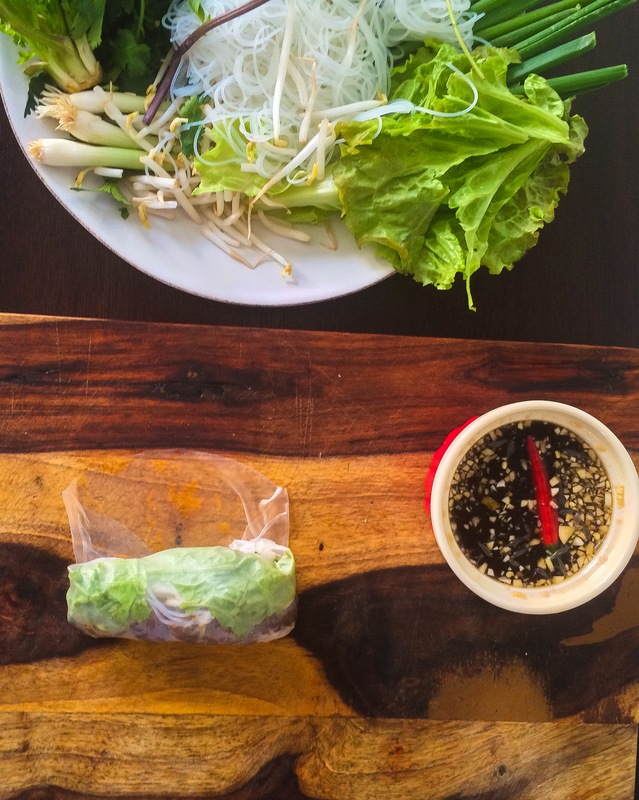 To make the rolls: Submerge rice paper in the hot water, allow excess water to drip off. Place on plate, lay 1/2 a piece of lettuce, 1 tbsp. 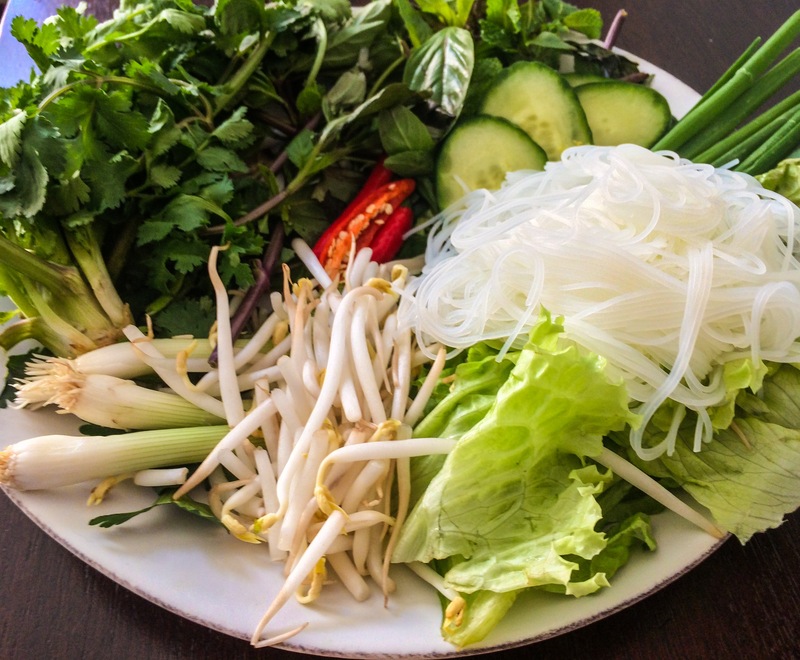 of rice noodles + beans sprouts, a sprinkle of cucumber, a few mint and basil leaves and a a few slices of beef on the bottom third of rice paper. Fold the sides over and roll to enclose. Dip in sauce and ăn cơm! Ready to dip! Make a double batch of the sauce in advance and keep in the fridge.